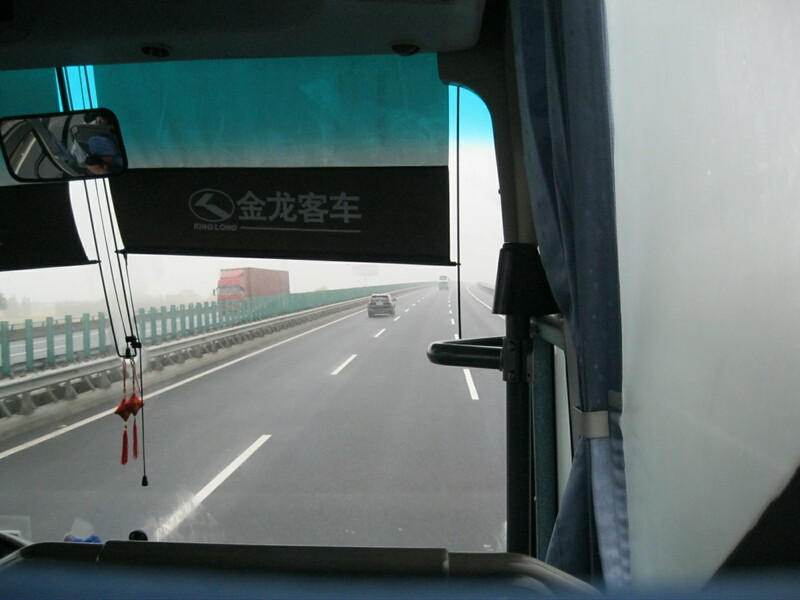 Saturday, November 10, 8:20 a.m.: The highway cutting across Zhejiang province is smooth and empty, its three lanes containing only a few trucks and tour buses in addition to our own. Just beyond the barricade separating the road from the fields that sit beside it, billboards rise every few hundred feet. Visit Xitang. Buy China Pacific insurance. Drink Jin Bai alcohol. Consider Art Flooring for your home decorating needs. Every once in a while, we’ll go through a stretch when the advertisements peter out and the billboards stand blank, waiting for a sponsor to come along and decorate them. The landscape here is flat and watery, enormous fields criss-crossed with streams and dotted with small lakes. I can’t see very far into the distance—a light rain and white fog have reduced visibility—but I’m staring out the bus window anyway, too tired to read but too awake to sleep. 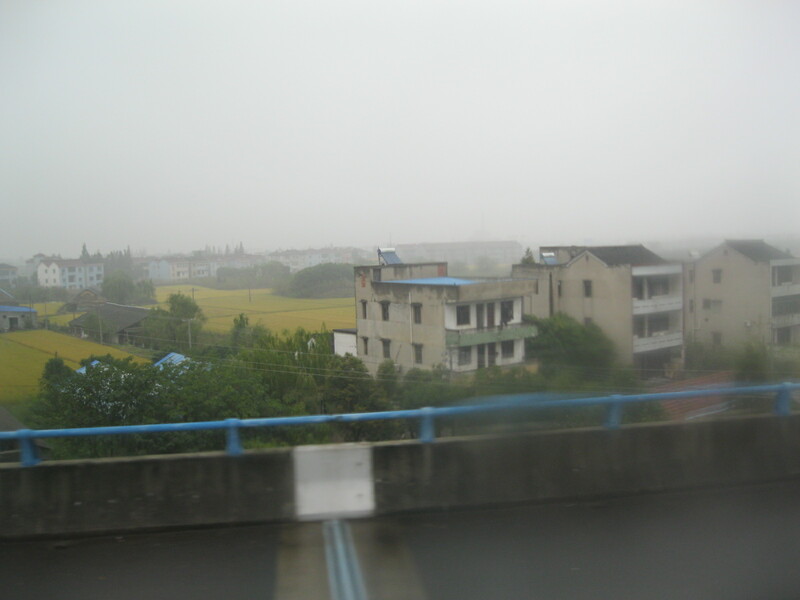 I haven’t been to this part of Zhejiang since summer 2006, when I spent six weeks at the CET language program in Hangzhou. The resident director from that program, Jeremy, has moved on to their campus in Shanghai, where I taught last summer, and Jeremy invited me along for this weekend’s field trip. We’re heading to Moganshan, a mountaintop resort that was renowned in the 1920s and ‘30s (a recent New York Times article called it “the Hamptons of that part of eastern China” during that time), fell into faded glory during the Mao years, and is now popular once again, thanks to droves of Chinese tourists on bus trips and foreigners seeking to create a luxury retreat only three hours from Shanghai. We’ve been driving for a little more than an hour now, and the bus is quiet as the students have settled down from their initial excitement about the trip. Most are asleep or, like me, listening to their iPods and gazing out the window. The houses I see are a mishmash of old and new: crumbling one-story brick farmhouses at one point, three-story homes with tiled exteriors the next. But even in front of the wealthiest-looking homes, I don’t spot any of the BMWs or Mercedes that frequent Shanghai’s streets. It calls to mind Hu Jintao’s instructions to the Chinese that they create a “moderately prosperous society.” While the newer homes are surely more comfortable than those they replaced, they’re modest in comparison to the private housing developments cropping up in suburbs surrounding China’s major cities. Like all of coastal China, Zhejiang is one of the country’s richest provinces, but coming from Shanghai, I’m quickly reminded that rich is always relative.